If you’re wondering where oil and gas production and hydraulic fracturing are happening near you, FracTracker has a new mapping tool that will help you find out. 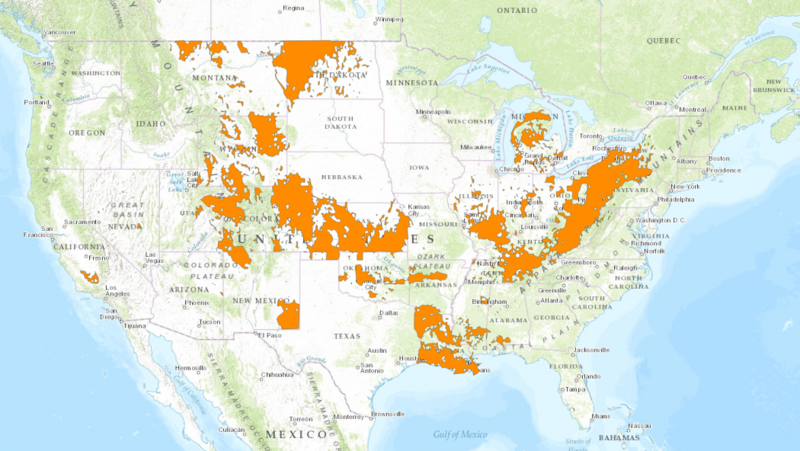 Areas where America's 1.1 million oil and gas wells, both conventional and hydraulically fractured, are found are highlighted in orange. Texas, where many of the wells are concentrated, is excluded because FracTracker was unable to publish data from the state. Researchers at FracTracker, an independent oil and gas research group that started as a mapping project at the University of Pittsburgh’s Center for Healthy Environments and Communities, analyzed oil and gas well location data for all 50 states and created a map showing where most of those wells are, including wells that have been fracked and those that haven’t. Fracking is the energy industry’s practice of injecting water, sand and chemicals deep underground at high pressure to extract crude oil and natural gas from dense rock formations. 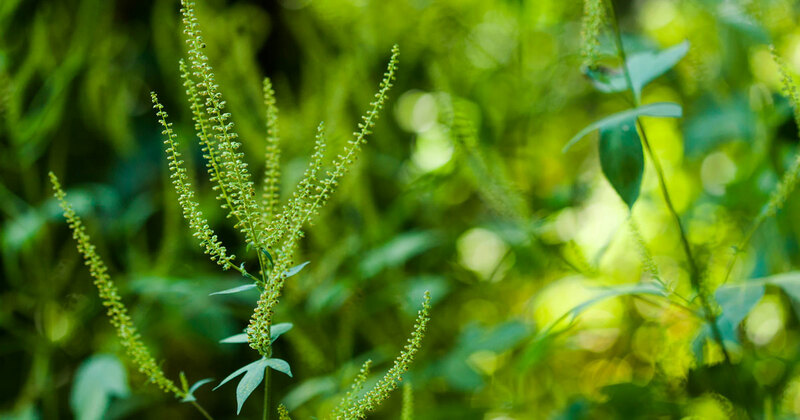 It’s controversial because of its not-fully-determined affect on public health and the environment. 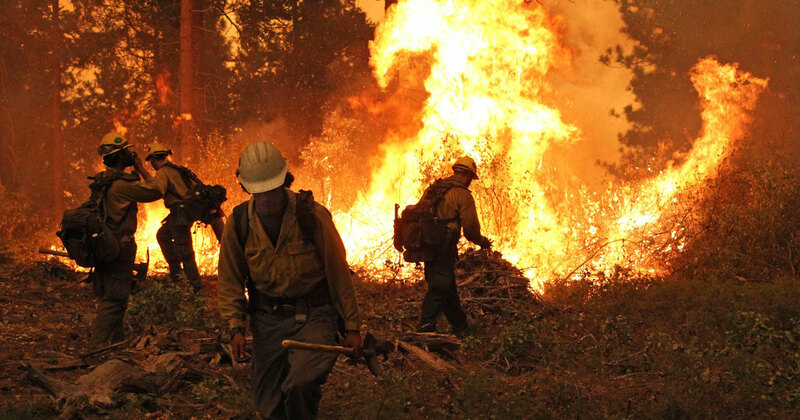 The fossil fuel produced by way of fracking contributes to climate change through the burning of crude oil and possible leaks of methane and other gas emissions from oil and natural gas production equipment and distribution pipelines. Using data available from individual state governments, FracTracker researchers counted more than 1.1 million active oil and gas wells across 36 states. 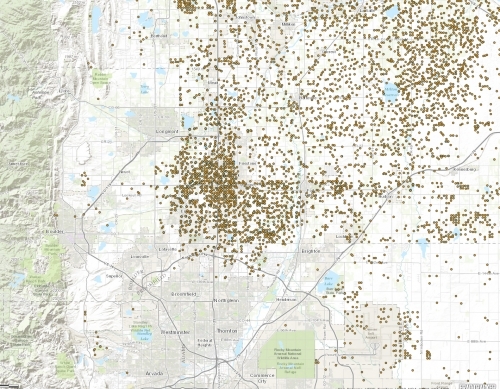 The group published most of the raw well location data on its website and mapped them. The result is an interactive map showing generally where you’ll find oil and gas wells, fracked or not, and the oil and gas basins where wells could be drilled in the future. 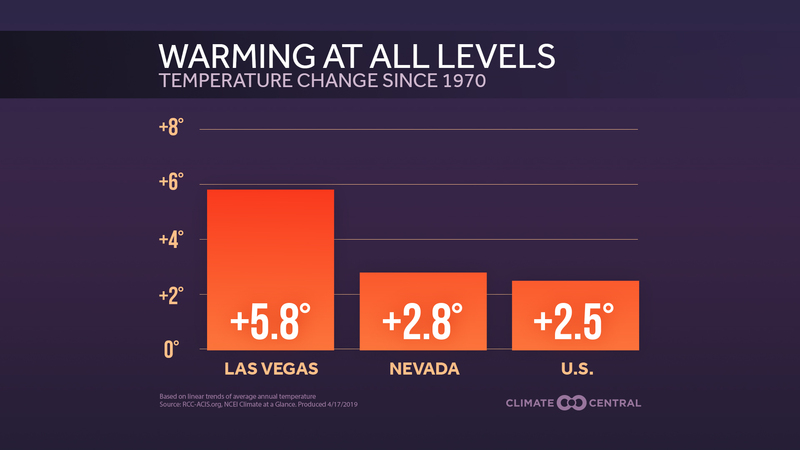 The glaring exception to this is the state where you’ll find the highest concentration of oil and gas wells in the country — Texas. FracTracker's map app also has the ability to zoom in on specific areas to show specific locations of individual oil and gas wells. 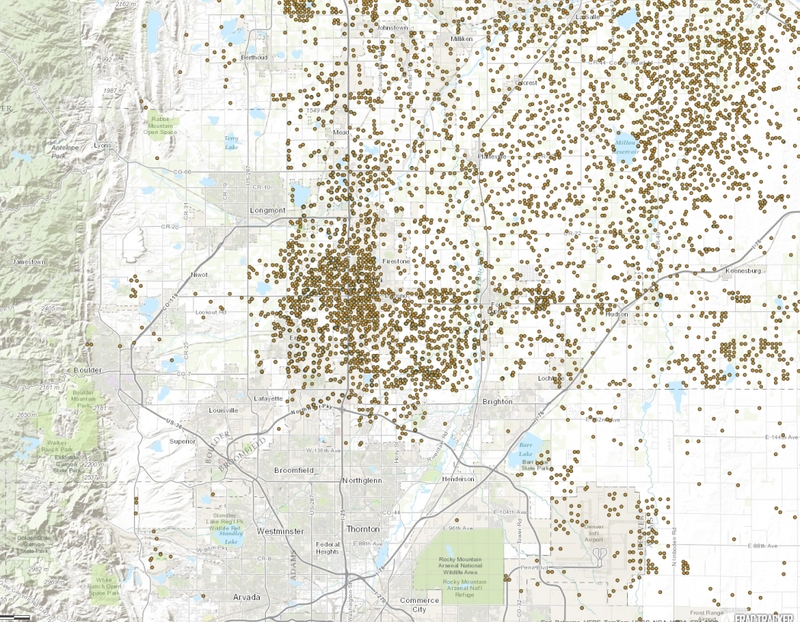 Here, the map depicts the distribution of wells in the Denver-Julesburg Basin along Colorado's Front Range urban corridor, north of Denver and east of Boulder. Each dot represents one well. FracTracker researcher Matt Kelso said Texas, which has more than 300,000 active oil and gas wells, is the only state that charges a fee for researchers to obtain location data for its wells, and FracTracker chose not to publish the raw data or depict it on the map because Texas does not allow the data to be redistributed. Aside from oil-rich Texas being a blank spot on the map, the oil and gas well location data the group compiled for the rest of the country comes with some interesting numbers and figures. To begin with, there is no confirmation that any of the wells included in FracTracker’s data have actually been fracked, except in Indiana, for which the group was able to obtain well fracking data. However, nearly all directionally or horizontally drilled wells have been fracked, Kelso said. 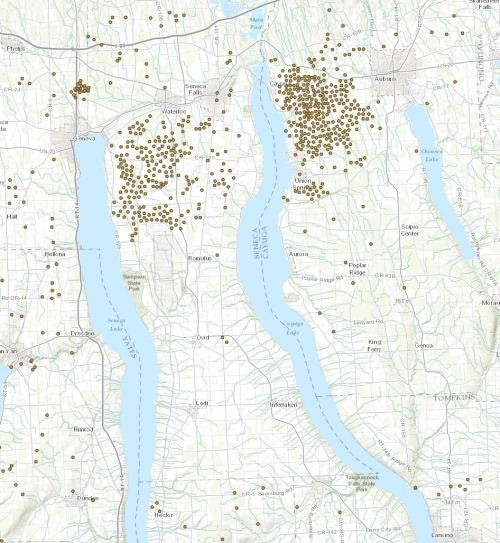 A moratorium currently bars fracking from ocurring in the state of New York, but FracTracker's map shows that New York has many oil and gas wells. 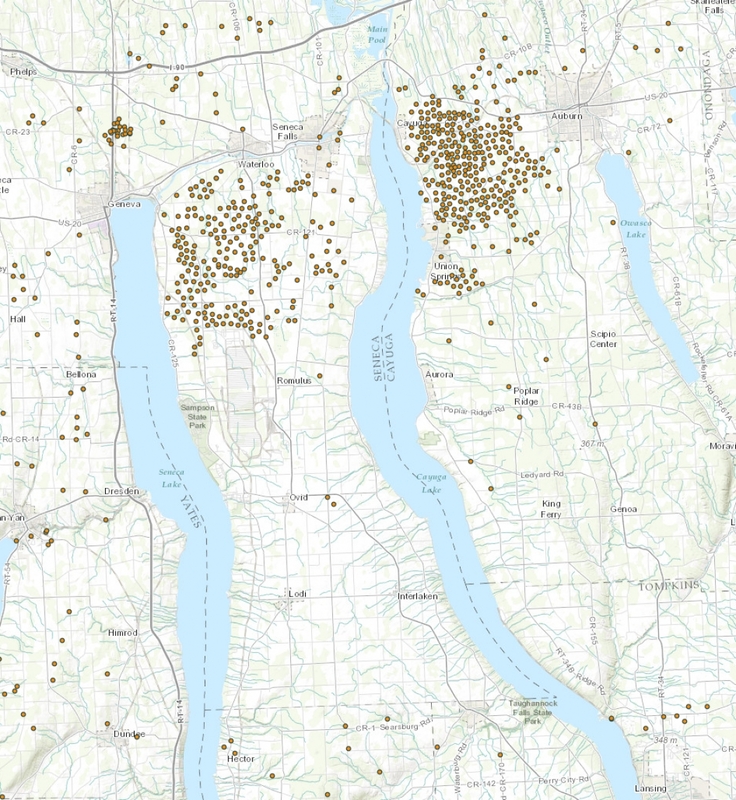 Here, the map shows a high concentration of wells in the Finger Lakes region of New York near Auburn, Seneca Falls and Geneva. Also of note: New York State, where a moratorium currently bans fracking until the state can decide how to regulate it, has more than 15,000 active oil and gas wells, mostly in western New York at the northern edge of the natural gas-rich Marcellus shale, FracTracker data show. But the data also illustrate how conflicting definitions of an oil and gas well can result in dramatic discrepancies in a state’s well count. For example, FracTracker data show that Colorado, where energy companies are feverishly drilling and fracking the Niobrara shale and other formations in the Denver-Julesburg Basin for crude oil and natural gas, ranks fourth in the nation for total active well count — 84,357 active wells. That’s fewer active oil and gas wells than only Texas, Pennsylvania and Kansas. But the state of Colorado’s official active well count was only 51,814 wells as of March 4 — the day FracTracker released its data. Colorado generally counts wells as “active” if they’re actually producing oil and gas, or have recently produced oil and gas. Kelso said FracTracker has a broader definition that includes wells that aren’t producing but haven’t yet been abandoned or permanently plugged. That means FracTracker's figures for how many oil and gas wells are currently in a state may be much, much larger than a state's official numbers. Regardless how an “active” oil and gas well is defined, FracTracker’s map shows where oil and gas wells have been drilled, and it’s useful to anyone who wants to know where energy companies are looking for oil and gas, where they might drill for it in the future and where fracking could happen near you.